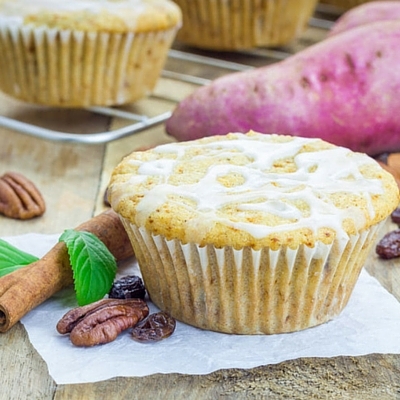 Sweet Potato muffins have excellent nutritional value with unique flavor and color. The sweet potato is botanically a member of the Morning Glory family. It is considered a root as opposed to potatoes which are tubers. Sweet Potatoes are native to the tropics, and were cultivated about 5,000 years ago by the Incas who called it “batata” which is the origin of the word potato. Outside of the tropics, sweet potatoes thrive in sandy soils in warmer climates. Currently, North Carolina is the leading producer of sweet potatoes with nearly 43 percent of the nations crop according to 2013 statistics. The top five producing states including NC are CA, MS, LA and FL. The types of baked products containing sweet potatoes are as wide ranging as the product developer’s imagination. A few examples are quick breads, yeast leavened artisan breads, pies, cakes, nutrition bars, muffins, donuts and cookies. Further processed sweet potato ingredients are available commercially as purees, dehydrated flours and granules, frozen and refrigerated dices/pieces, pre-cooked and canned variations, juice concentrates and single strength juices. Per capita consumption has increased by nearly 75 per cent over the past decade primarily due to the excellent nutritional story. Considered a “superfood”, sweet potatoes are high in vitamins A and C and are considered good sources of manganese and fiber. Sweet potatoes are complex carbohydrates which provide energy and antioxidants readily and are low in calories.